Southern hard shell clams were once abundant in our waters, but now are almost entirely gone. Sarasota Bay Watch is working to bring them back. Since late 2016 SBW has been growing 200,000 of these native clams under the watchful eye of a professional clam farmer in the Boca Grande area. 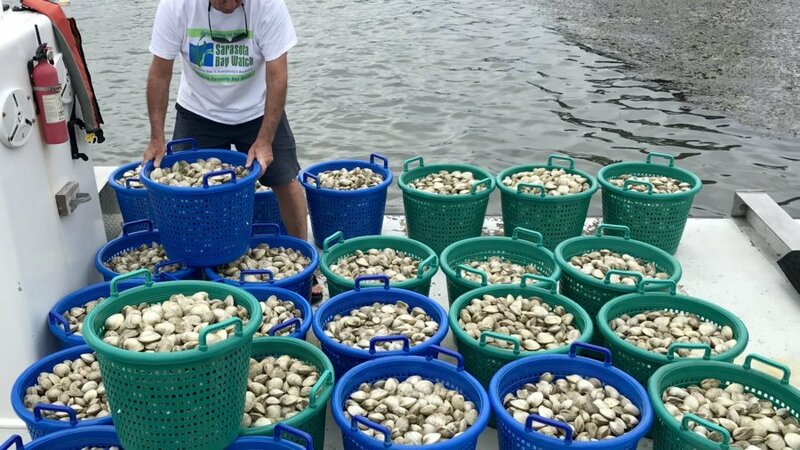 Now we are thrilled to have completed the first harvest and release of about 32,000 clams into Sarasota Bay. Over the course of the summer SBW volunteers will do it six more times! Follow this link for a short video of SBW’s clam restoration volunteers in action. Clams grow more slowly than bay scallops, which are fully grown in one year. Our southern hard shell clams are just over one year old yet are merely young adults. We took extra care and time to grow them to a larger size (past the size that restaurants use) both to make them less desirable to poach by humans (sadly it happens), and so they will be more “predatory proof.” Most crabs and rays that feed on smaller clams are not able to get into the heavy duty shells of these older clams. At this point each clam is safely tucked inside its own castle with thick, virtually impenetrable, walls. While there are still a few predators, such as large rays and big whelks and conchs, most of the perils of growing up the bay are behind them. Let’s hope they thrive and multiply! These native clams will live for 30 years or more, and each adult can filter up to 50 gallons of water per day! Clams are great for the bay because they reduce excess nutrients in the water, remove solids allowing sunlight to penetrate deeper, which promotes more sea grass growth, sequester carbon, create lots of food for marine life, which supports important commercial interests like sport fishing, and they consume red tide – potentially helping to reduce local impacts of red tide in the bay. Clams once were an important part of the bay, and they should be again. In addition to the benefits of reintroducing 200,000 clams back into the bay, SBW has learned a ton about clam restoration, developed a streamlined process, gained valuable experience, and established a network of volunteers, sponsors and supporters. We are ready for a bigger and better round two of restoration! Reminder: harvesting clams is not allowed in Sarasota Bay at this time. Check the Florida Wildlife Conservation Commission website for information and regulations.